The Certified Nursing Assistant or Certified Nurse Aide assists the Registered Nurse, Licensed Practical Nurse and other healthcare professionals in hospitals, hospices, nursing homes and long-term care facilities. Many CNAs discover they truly enjoy providing healthcare services and decide to pursue a degree to become a Registered Nurse or Licensed Practical Nurse. It is a rewarding career that offers people with a variety of medical needs the attention and basic services required to preserve the quality of life. The South Dakota State Board of Nursing (SDBON) is the government agency that is responsible for approving state-approved CNA training programs and maintaining the CNA State Registry. The Certified Nurse Aide falls in the category of Unlicensed Assistive Personnel (UAP) in South Dakota. The Nursing Aide must maintain active SD CNA Registry status but is not required to obtain a license. Following are guidelines to assist people interested in achieving CNA status in South Dakota. In South Dakota, the SDBON approves nurse aide training programs. The state requires a minimum of 75 hours of didactic and clinical training. It is very important to attend a state-approved program because the SDBON has reviewed the curriculum and made sure it meets minimum state and federal requirements. There are approximately 107 state-approved CNA programs in South Dakota, but the number is not fixed. Always check current listings when looking for CNA classes in South Dakota to ensure all options are considered. The large majority of South Dakota CNA programs are offered at nursing homes and assisted living facilities. That is where the greatest need is found for Certified Nurse Aides as the population ages. There are a few non-nursing home facilities offering CNA programs. The Avera CNA Online Training Solutions Curriculum and We Care Online offer online coursework. The coursework is completed online, but the student must satisfy clinical training requirements. 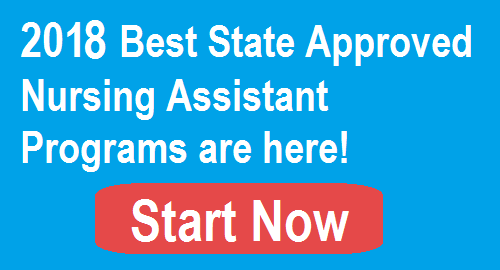 If you want to become a Certified Nurse Aide in South Dakota by taking one of the state-approved CNA programs in the state, check the following school table to find the best school near you. The data is updated in May 2017. Bristol Nursing Home Sun Dial Manor, Inc.
Marion Nursing Home Tieszen Memorial Home, Inc.
Philip Nursing Home Philip Health Services, Inc. The student may be employed for up to four (4) months while training but must obtain registry status before the end of the four months. Costs at educational facilities can vary. As of 2017, Southeast Tech Community College‘s CNA training program costs were $710. Students accepted into the Boxelder Job Corps Certified Nurse Assistant are not charged any fees, but they must live in campus dormitories while in the program. The We Care Online CNA course costs $290, but 50 hours of didactic learning is completed online and 40 hours of clinical training is completed at a long term care facility. It is important to evaluate all the options before making a final decision. It is also advisable to check with school or program staff to ask if financial aid is available. After completing the 75 hours of didactic and clinical training in a state-approved program, the Nursing Assistant will then take the Competency Evaluation Exam. In South Dakota, D&S Diversified Technologies dba Headmaster is under contract with the South Dakota Health Care Association to provide the CNA testing and scoring services. The employer or the CNA program staff will submit the student’s name for testing. The examination has two sections including a Knowledge/Oral Test and a Manual Skill Test. This section has 75 questions that are selected from 9 major subject areas: such as safety, communication, infection control, basic rights, basic nursing skills and personal care, role and responsibility, physical health and illness, mental health and illness, the aging process and other areas. The student has 90 minutes to do the test and must get a minimum score of 75 percent. This section of the test assesses three or four CNA skills including one mandatory task and two or three randomly selected ones. The mandatory skills tasks are toileting using a bedpan and emptying a urinary drainage bag. The randomly chosen skills are selected from a list provided in the Headmaster’s Candidate Handbook. They include skills like abdominal thrust to address choking, ambulation with a cane or walker, ambulation with use of a gait belt, applying antiembolic stockings, taking patient vital signs, brushing resident teeth, changing an occupied bed, denture care, assisting with dining, measuring total fluid consumed, donning and removing gown and gloves, resident hair care, mouth care of a comatose resident and others. The student must get a minimum score of 75 percent on each skill. Certification requirements require passing both exam parts. Headmaster provides test results to the South Dakota Health Care Association which then provides test results to the student and the employer. If the exam taker fails a Knowledge or Skill Test, the failed test will have to be retaken. Completing CNA training and passing the competency evaluation exam is one path for earning CNA certification in South Dakota. The South Dakota Health Care Association maintains the South Dakota Nurse Aides Registry, and enters the nurse aide’s name after verification the student passed the exam. There are other paths to becoming a CNA in South Dakota. Out of state Certified Nursing Assistants can request to be included on the South Dakota CNA Registry by submitting the CNA Interstate Endorsement Application to the South Dakota Board of Nursing. Nursing students who completed a Fundamentals of Nursing course – RN or LPN students who successfully complete a Fundamentals of Nursing course can request a waiver from the requirement to complete a 75-hour nurse aide training program. If approved, the student can take the CNA Competency Evaluation exam. A Nurse Aide training program instructor can review the competence of students who were educated in other healthcare fields. This applies to a healthcare professional who is a physical therapist, EMT, respiratory therapist, occupational therapist, paramedic or medical assistant. The person has to enroll in a state-approved CNA training program, and the instructor determines the areas where the person needs additional training in order to meet state curriculum requirements. The instructor qualifies the person to take the competency evaluation test. The renewal request is done online and is processed after verification the minimum requirements are met. If the CNA has a lapsed certification but meets the two renewal requirements, the person can contact the SDBON to request certification reinstatement. A person with a lapsed certification cannot renew online. If someone with a lapsed certification cannot meet the annual training and paid employment requirements, the person will need to retrain and take the CNA state tests.